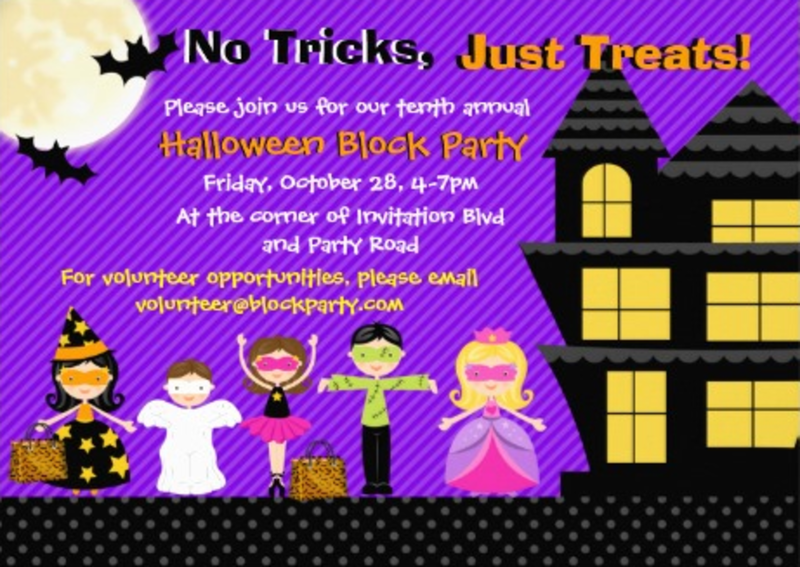 Over the years I have hosted a few Halloween parties for my kids. 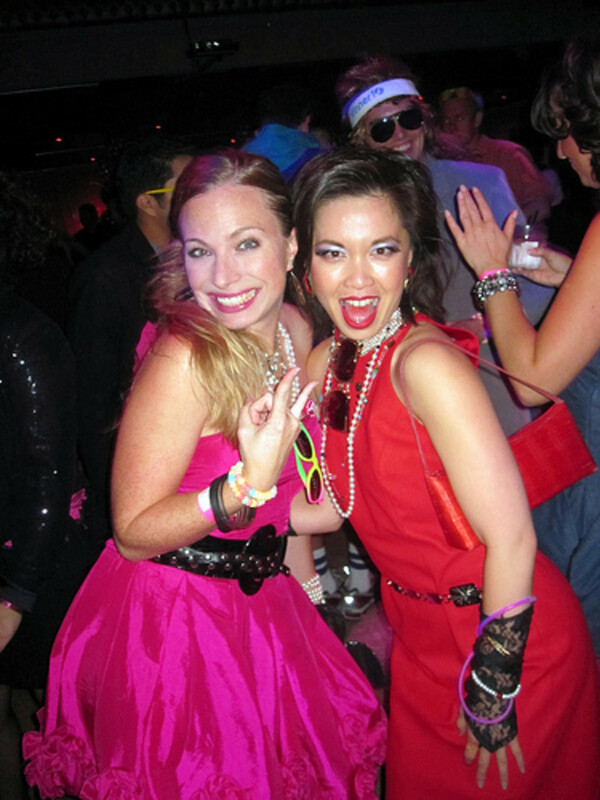 This page features many of our party ideas including actual photos from our party. 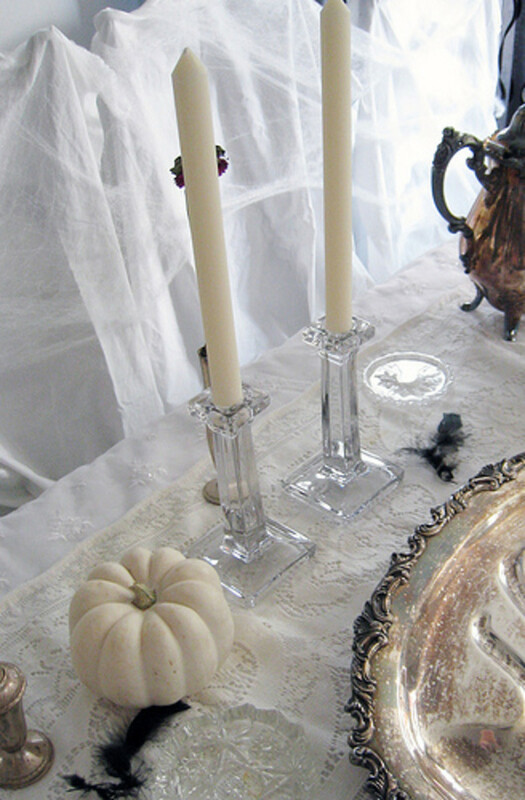 Some of the decorating ideas you will find here include creepy bottle labels, candy filled skulls & spider goblets, Halloween themed partyware, table centerpieces and more. 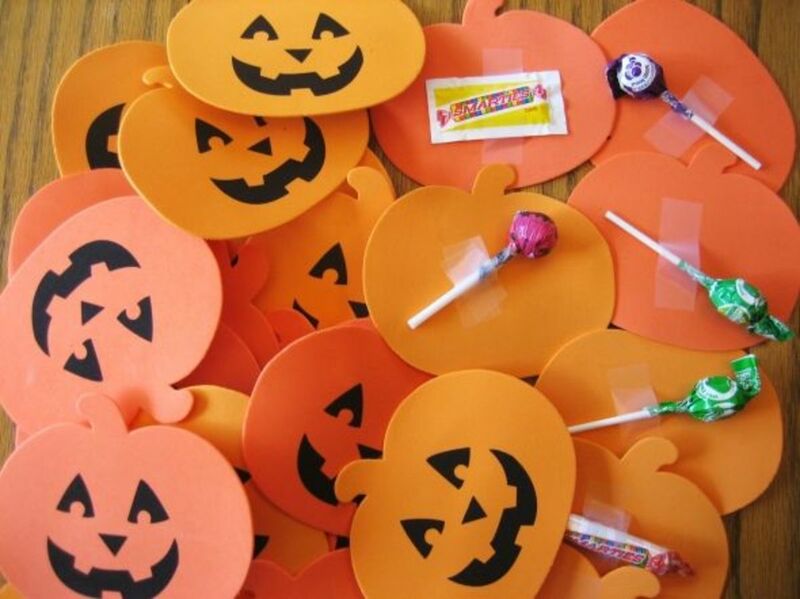 You will also find fun party games such as Pumpkin Hunt, Eye-ball Toss Game, Ring Around the Pumpkin Game, Treasure Hunt, Pin the Tail on the Black Cat, Gummy Worm Hunt Game, Bingo, Word Scramble, Guess How Many Candy Corns and Pinatas. These parties were geared to kids of various ages. So, regardless of how old your child is, you are sure to find some wonderful ideas here. 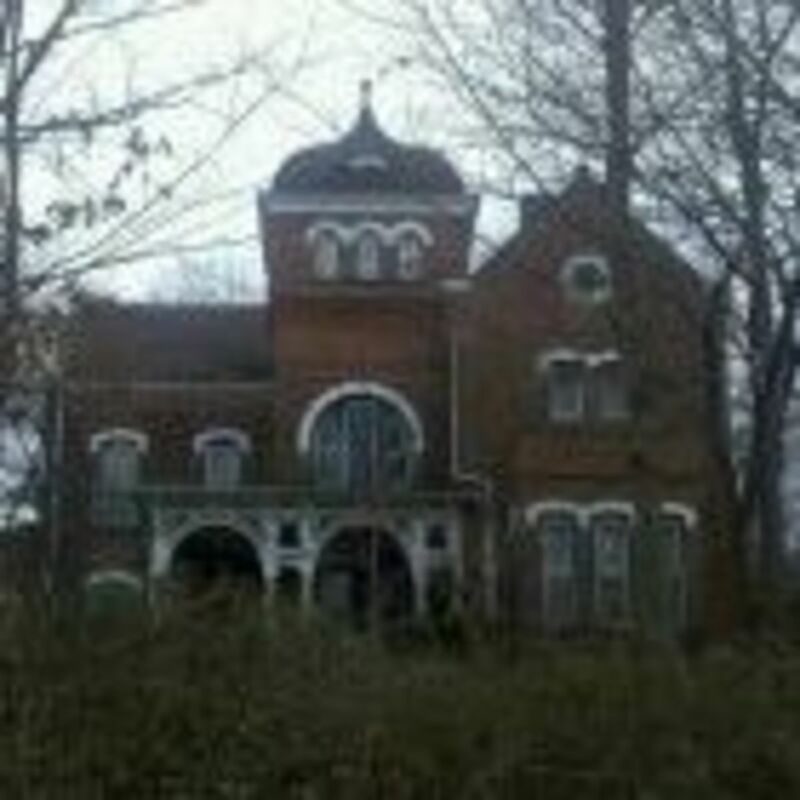 All of the photos featured on this page are my own. Please do not use without permission. 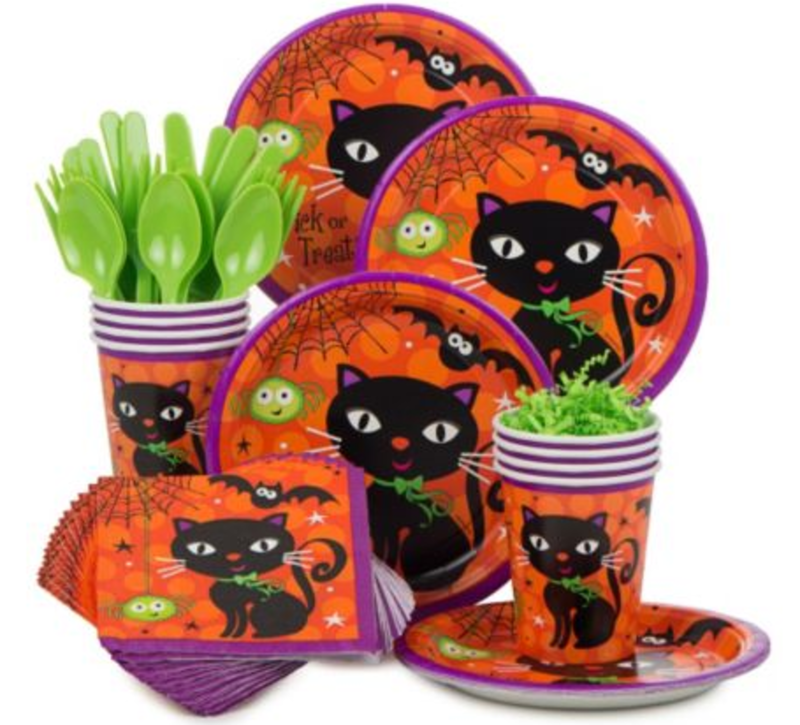 For our party table décor, we incorporated fun Halloween party plates, cups, tablecover and accessories. I selected partyware that was cute and ideal for kids. The party items featured smiling ghosts, pumpkins, witches,skulls and black cats. Others items we used to decorate the party table were plastic and rubber spiders & creepy bugs. I purchased Halloween themed bowls at the Dollar Store,filled them with snack foods and placed them on the table as well. 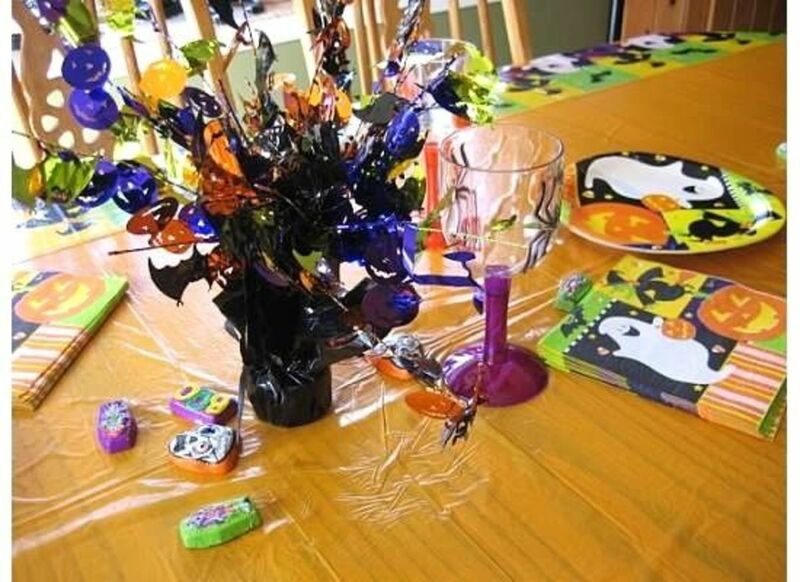 I also bought some Halloween themed candies and tossed them on the table. 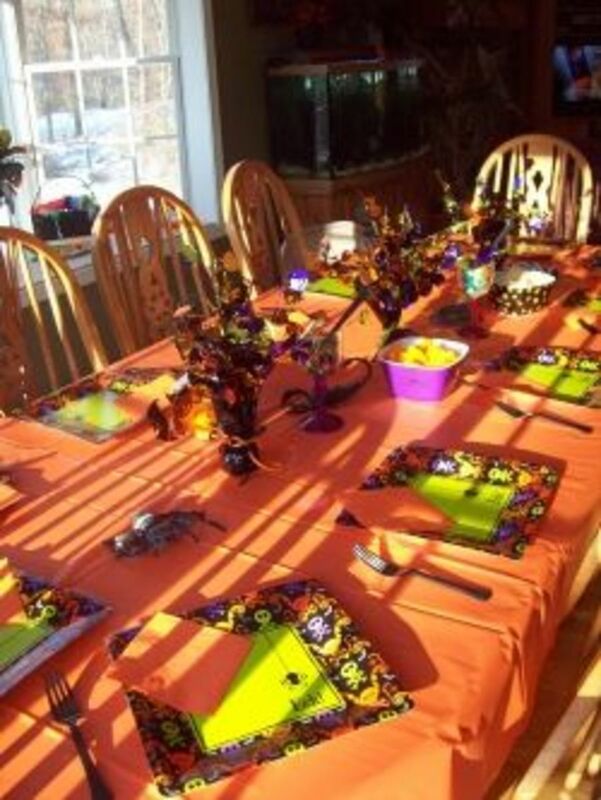 The centerpiece pictured above was embellished with sparkling pumpkins and bats in purple, orange and green. These centerpieces were well made and we got a few years of use out of them. Another fun item we placed on the party table were goblets filled with M & M candies. I purchased the goblets at the Dollar Store. There was a gold skull, pumpkin and black spider. 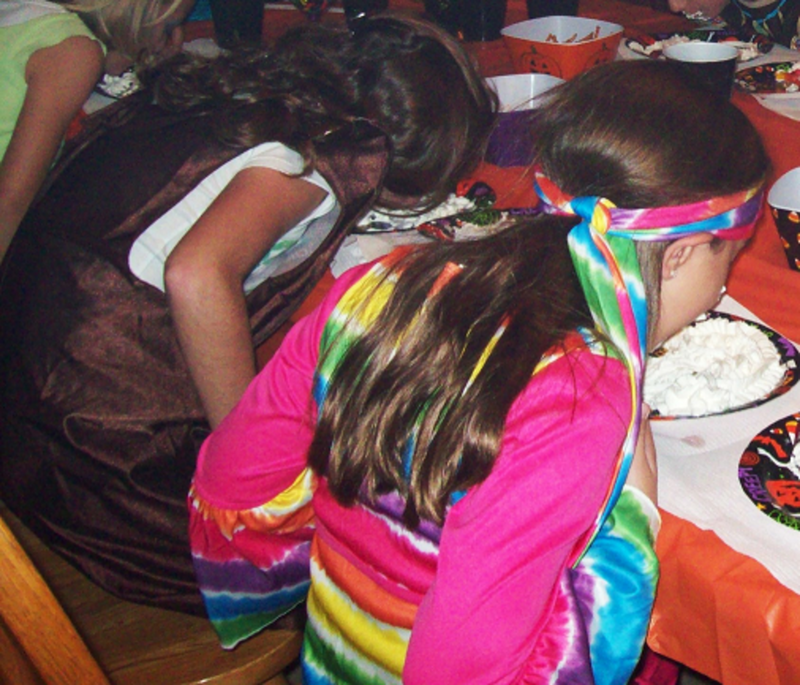 I then filled each goblet with a Halloween mix of M & M candies in green, purple and orange. 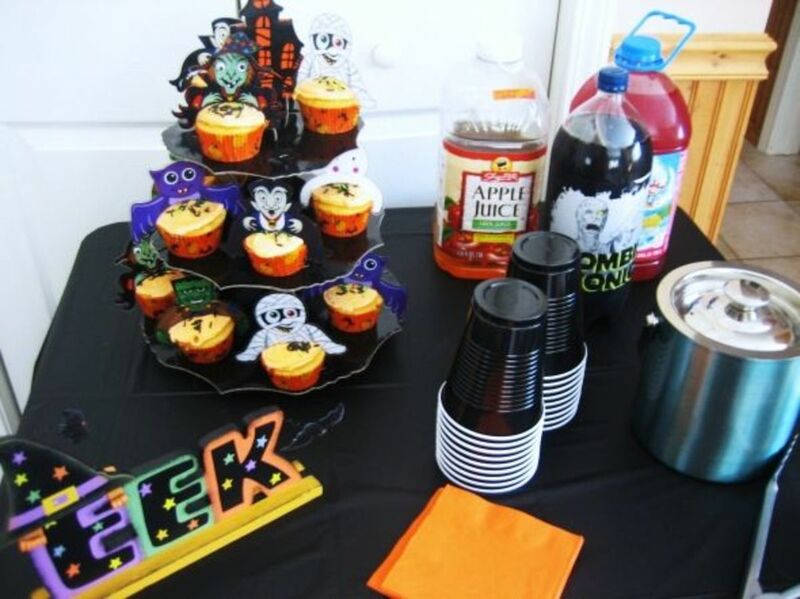 I placed a spoon in each goblet so the kids could help themselves to these sweet treats during the party. Not only were they delicious, they looked wonderful on the party table. These goblets were another great Dollar Store purchase that we got a lot of use out of. 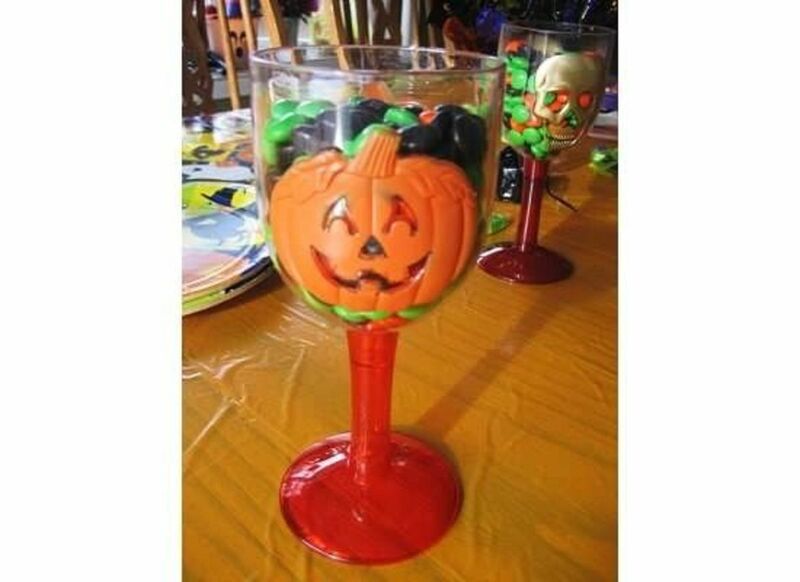 We still used these goblets at Halloween to decorate. I love these soda bottle labels! We have used them at all of our Halloween parties. I wish I had taken more photos of them, but this is the only photo I could find. These labels work on any 2 liter bottle. Simply peel the original label off of the bottle and them add the self stick label. 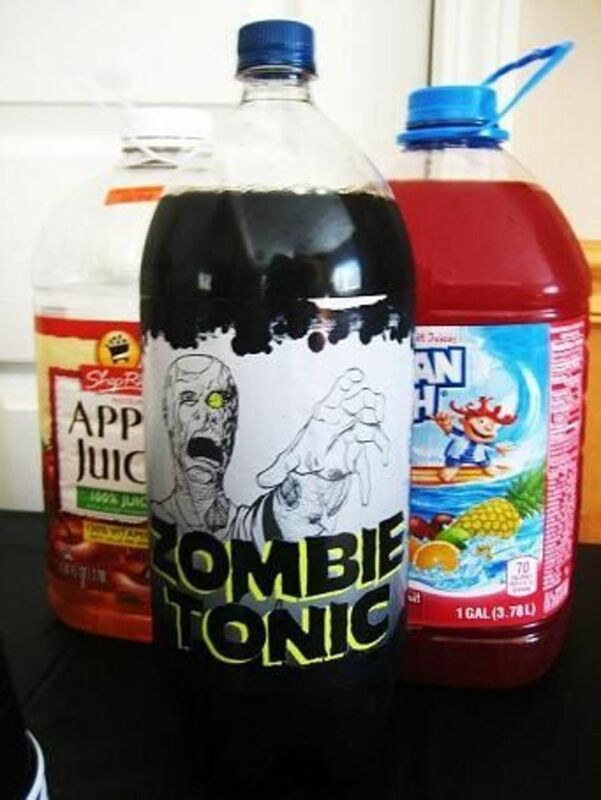 Some of the sayings included "Zombie Virus", "Truth Serum", "Spider Venum" and "Zombie Tonic". They looked great on the party table. These creepy labels are so easy to apply to any 2 liter bottle of soda. They are a simple peel and stick. The designs include zombies, spiders, phantoms and truth serum. Great Halloween party drink labels including Bats Brew, Zombie Tonic, Bone Juice and Spider Cider. Our Halloween Cupcakes - Adorable cupcakes arranged on a festive cardboard stand. I was very happy with how these cupcakes came out. There are literally hundreds of Halloween cupcake decorating supplies on the market, so it was hard to choose the decorations for our party. However, I finally decided to purchase these cute "huggable" cupcake picks. I have seen these before in different party themes and always wanted to give them try. The picks included ghosts, witches, mummies, bats, Frankenstein and Dracula. Once they were placed in the cupcakes, it appeared as if they were "hugging" the cupcakes. After the party, I washed the toppers and saved them since they were too cute to throw out. I hope to use them again! I baked the cupcakes in theme liners, frosted them with icing tinted orange and topped them with Halloween mix sprinkles. 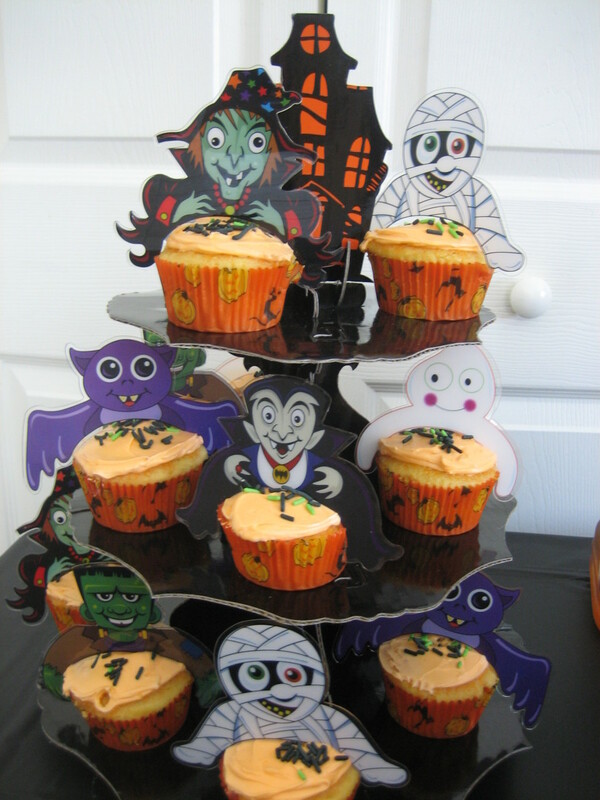 The cupcakes were displayed in a Halloween theme cardboard cupcake stands I purchased at my local party store. I love displaying cupcakes in these types of stands. Pumpkin Cupcakes - Smiling pumpkin cupcakes. These pumpkin cupcakes came out so cute! 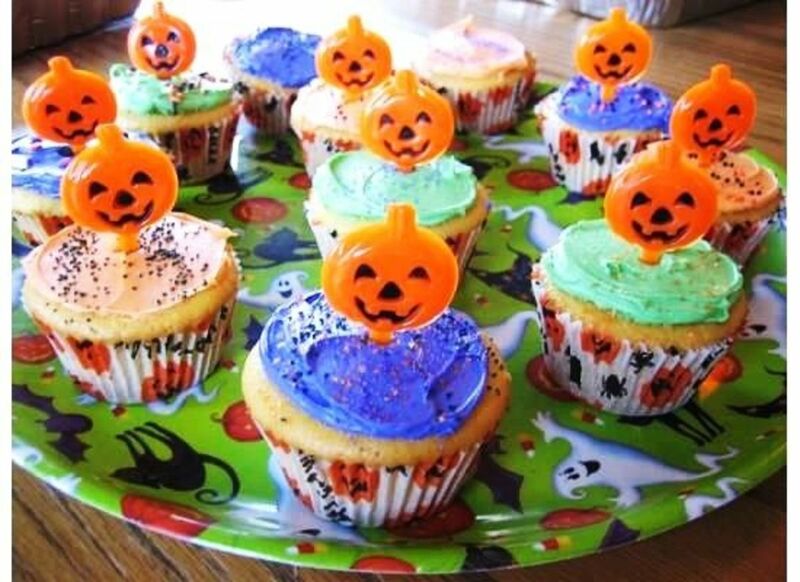 I baked the cupcakes in Halloween theme baking liners and frosted them with icing tinted orange, green and purple. I then embellished them with coordinating colored sprinkles and placed in adorable pumpkin cupcake picks. The finished cupcakes were displayed on a Halloween serving tray. The tray was another great Dollar Store find! Personalized Candy Favors - Customize these wrappers for your celebration. I love handing out candy bars as party favors. Since the kids were all different ages and I wanted to hand out one type of favor, these worked out perfectly. Regardless of age, kids love chocolate! I wrapped the bars with labels that were personalized with all of my kid's names. 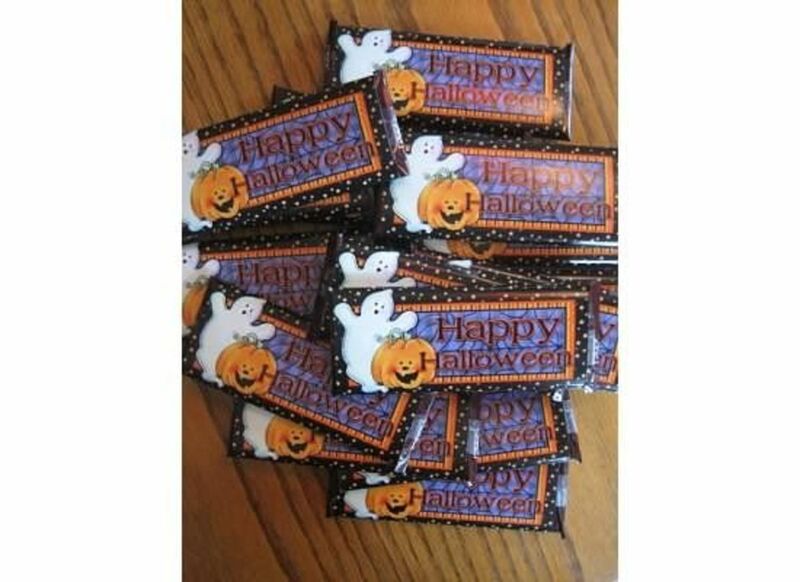 Click here to view a large selection of Halloween Candy Bar Wrappers for your spooky celebration! Cauldron Party Favors - Cauldrons filled with sweet treats. Another year we handed out black cauldrons filled with candy. I found these plastic cauldrons at my local party store. I filled each with an assortment of candy including theme candy. I then wrapped each cauldron in a clear bag and tied them with orange, green and purple curling ribbon. 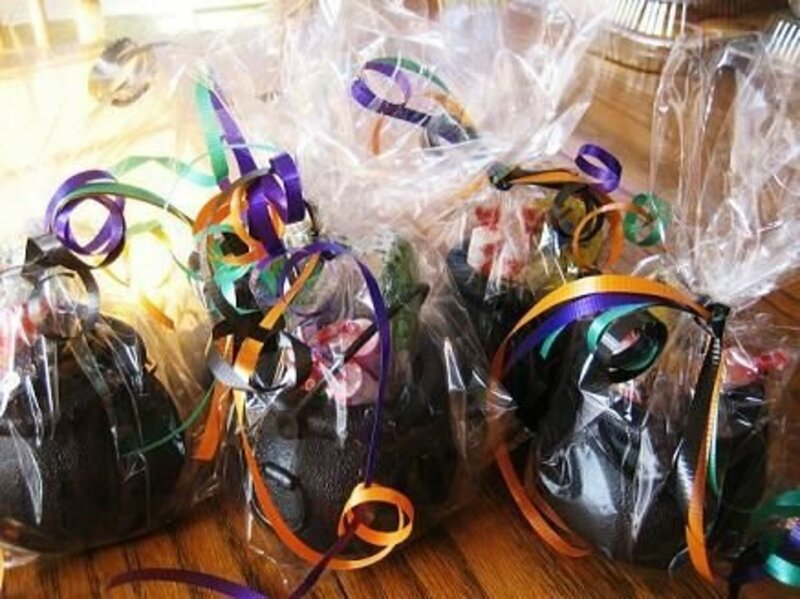 Black Cauldron Favors - Fill these cauldrons with candies and wrap in cellophane bags. These mini cauldrons make wonderful party favor containers. Each order comes with 6 cauldrons measuring 2.5" x 2.5". 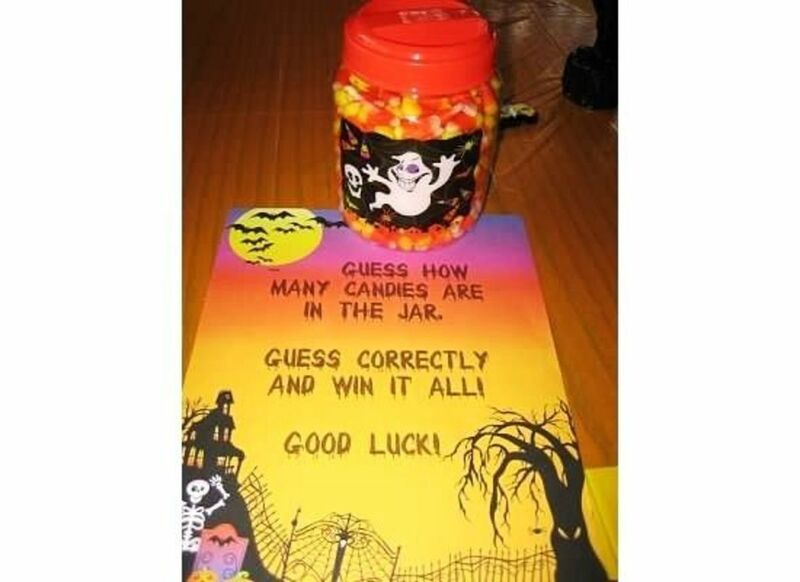 Guess How Many Candy Corns Game - The person closest without going over wins all the candy! The Guess How Many games works well at so many party themes and was perfect for our Halloween party. I purchased this theme container at the Dollar Store and filled it with candy corns. And, yes, I did count exactly how many were in the container! A few kids asked me during the party if I had actually counted the candy corns before placing them in the container and couldn't believe it when I said yes. I then typed up a fun message on theme paper to place next to the container. Everyone wrote their guess on a piece of paper and at the end of the party we found out who was the closest without going over. 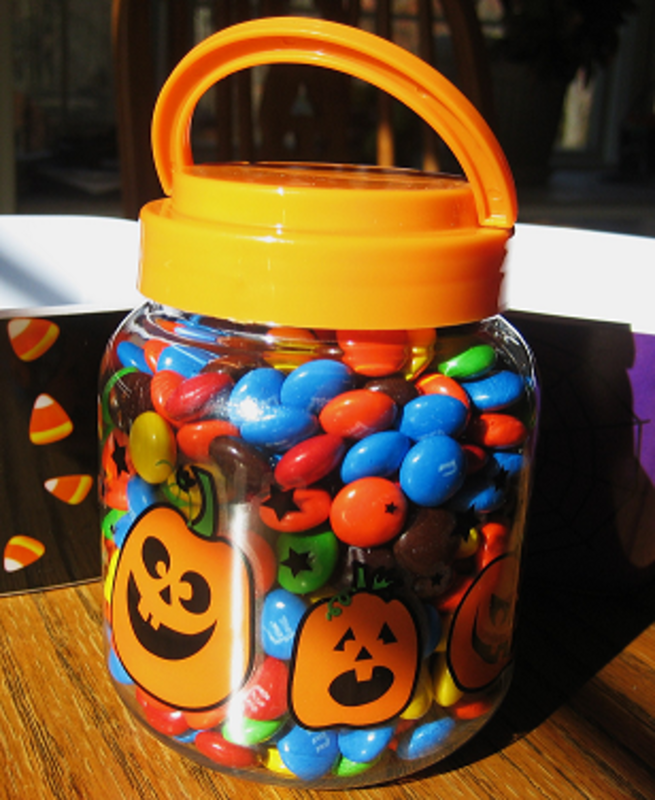 The next year, we did a similar game, but we filled the container with M & M candies. Since each of my kids invited their friends it was like three parties in one. Therefore, I decided to purchase three different piatas. These piatas were slightly smaller than the normal ones I buy and they were perfect for a small number of kids. Each of my kids and their friends had their own piata to bash open. 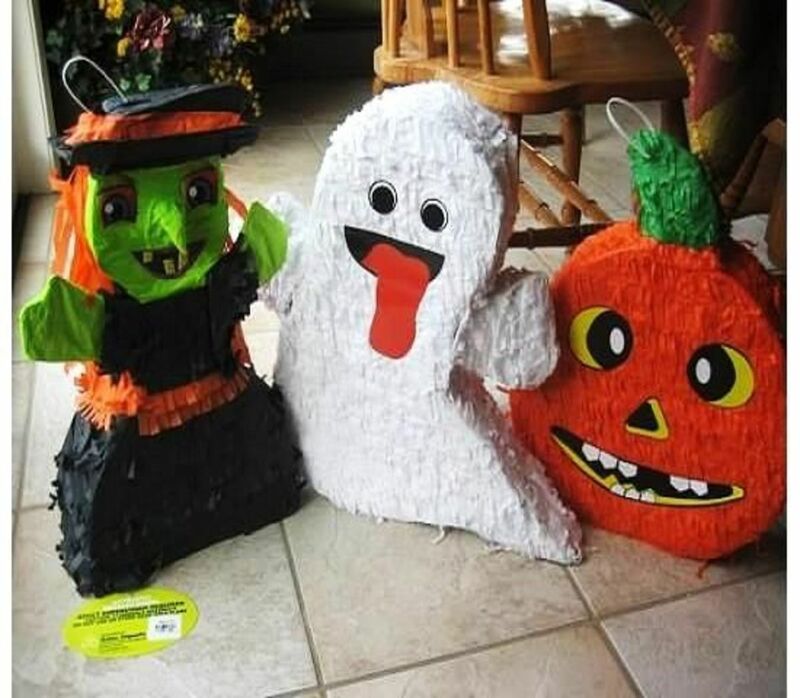 The piatas included a witch, pumpkin and ghost. Eyeball Toss Game - See how many eyeballs you can get into the cups. This was a fun party game for the kids. 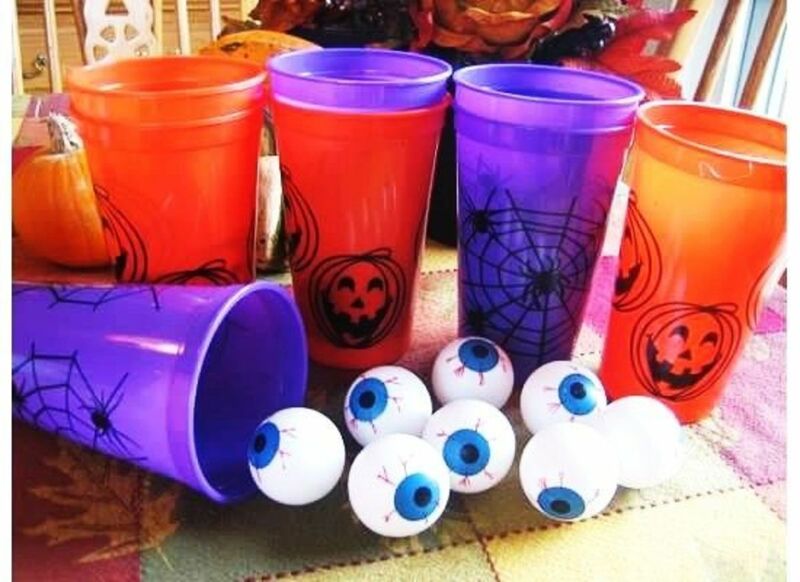 I purchased a bunch of Halloween theme cups at the Dollar Store and eyeballs at the party store. For the game, I placed the cups randomly on the floor fairly close to each other. The kids took turns tossing the eyeballs to see if they could get them into the cups. The game was placed on ceramic tile and these balls sure did bounce! The game kind of reminded me of the ping pong ball toss game that you often see at carnivals. Halloween Bingo - A fun twist on a classic game. Bingo is always a fun party activity. I purchased these bingo cards from Ebay seller TrulyBillieve . The bingo cards can be personalized and printed at home. The calling cards included both words and pictures so worked well for kids of various ages. 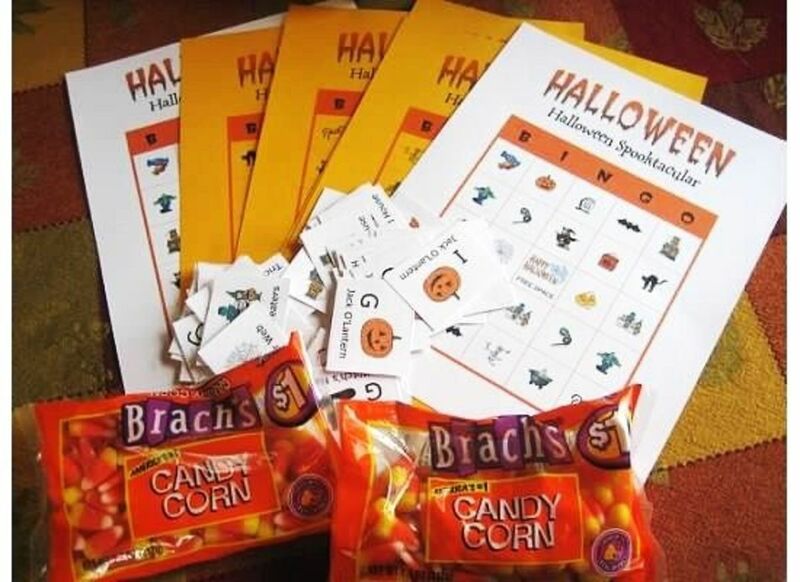 For the bingo counters, we used candy corns. Pumpkin Hunt - Fun the pumpkins and get some candy. This was a last minute party activity I put together. I saw these bags of foam pumpkins at the Dollar Store and knew I wanted to do something with them. I decided to create a Pumpkin Hunt game with them. I taped a piece of candy on the back of each pumpkin. Then I hid the pumpkins around the house and the kids went on a search to find as many pumpkins as they could. This game could also be played outside if the weather is nice. Gummy Worm Hunt - Messy Halloween fun. Gummy Worm Hunt is a classic Halloween party game. This game is very messy, so be sure to explain that to the kids beforehand to make sure they want to do it. At my parties, the majority of kids always want to play. For this game, you place 10-12 gummy worms on a plate for each child. I used our Halloween party plates. 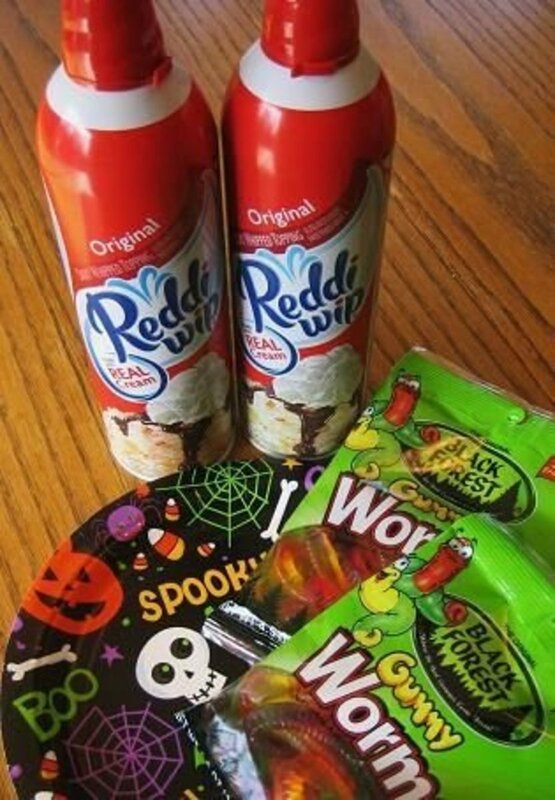 Then completely cover the gummy worms with whipped cream. Give each child a plate and they have to remove the gummy worms only using their mouth. They can't use their hands. The first one to remove all of their gummy worms wins. Gummy Worm Hunt Party Photo - My daughter on the left and my niece on the right. 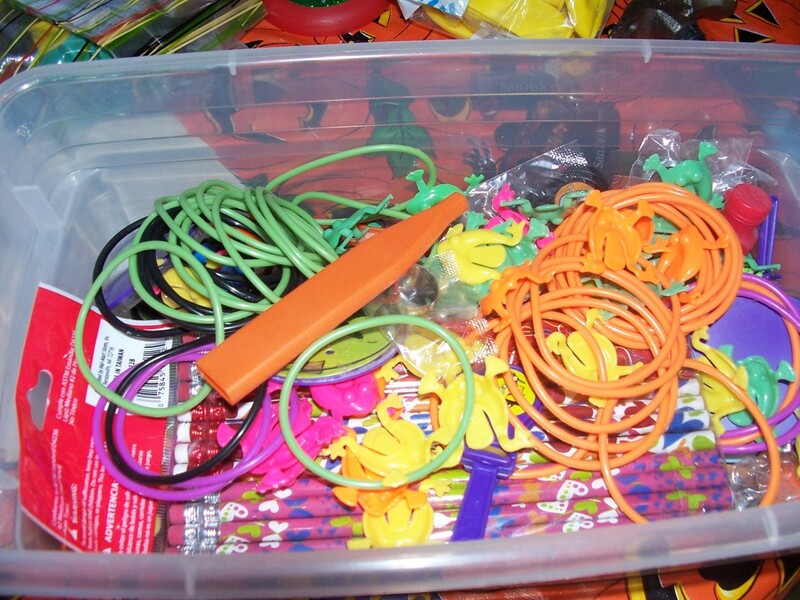 Pumpkin Toss - Glow necklaces add excitement to this toss game. This was a cute game and harder than it looked. I purchased a bunch of mini pumpkins with pretty long stems and glow necklaces. 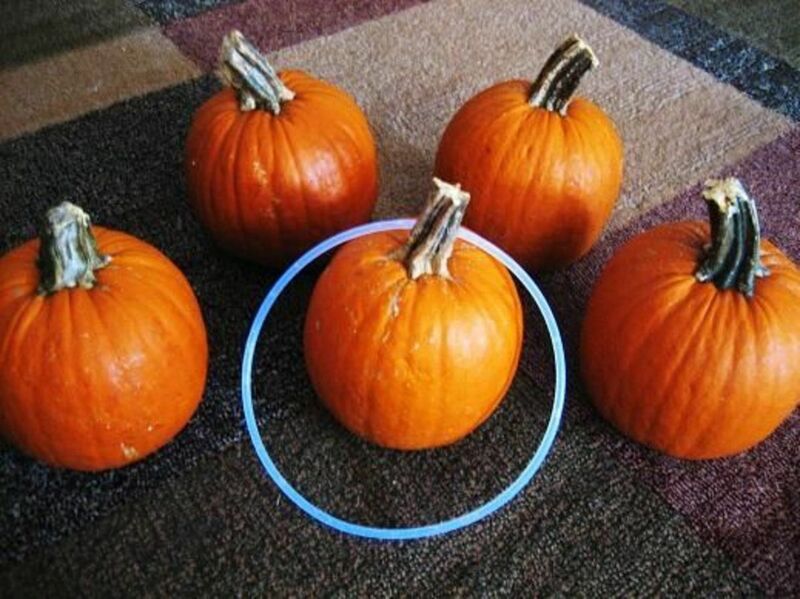 I placed the pumpkins on the floor and the kids took turns tossing the glow necklaces to try to get them to land on the pumpkin stem as pictured or completely around the pumpkin. After the game was finished, the kids wore the glow necklaces for the rest of the party. Treasure Hunt - Feel free to use these riddles I composed for your party. This Halloween treasure hunt took awhile to put together, but I had so much fun doing it! I actually composed all of the riddles myself. 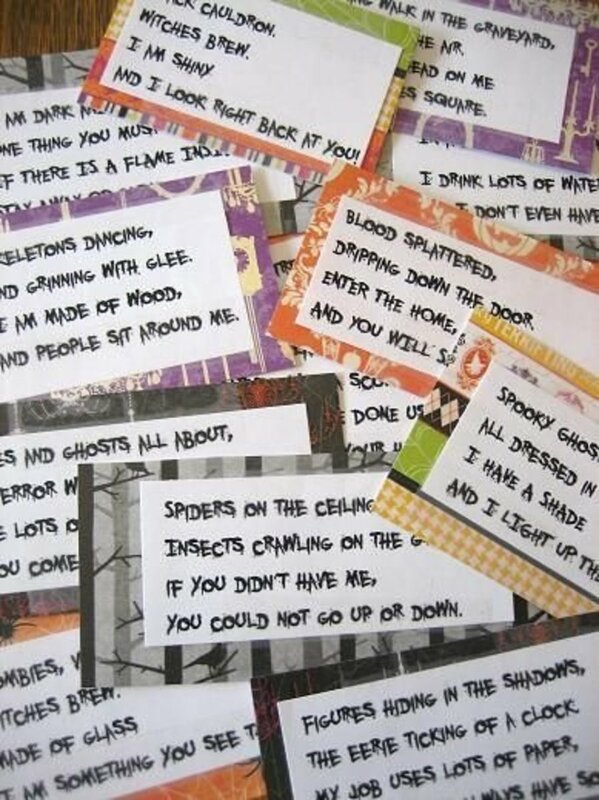 Please visit my Halloween Treasure Hunt page to view all of my wonderful riddles and find out how we played this game. Word Scramble - A great thinking game for the older kids. 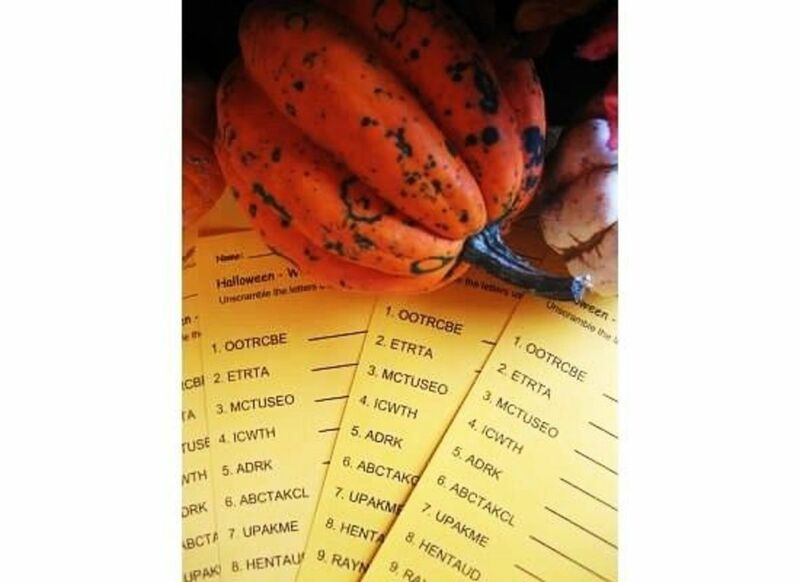 I found a fun Halloween word scramble on the Internet and printed it out onto orange cardstock. I placed the word scrambles on the table and the kids tried to figure them out. This game was better for the older kids at the party. Kids love tattoos. 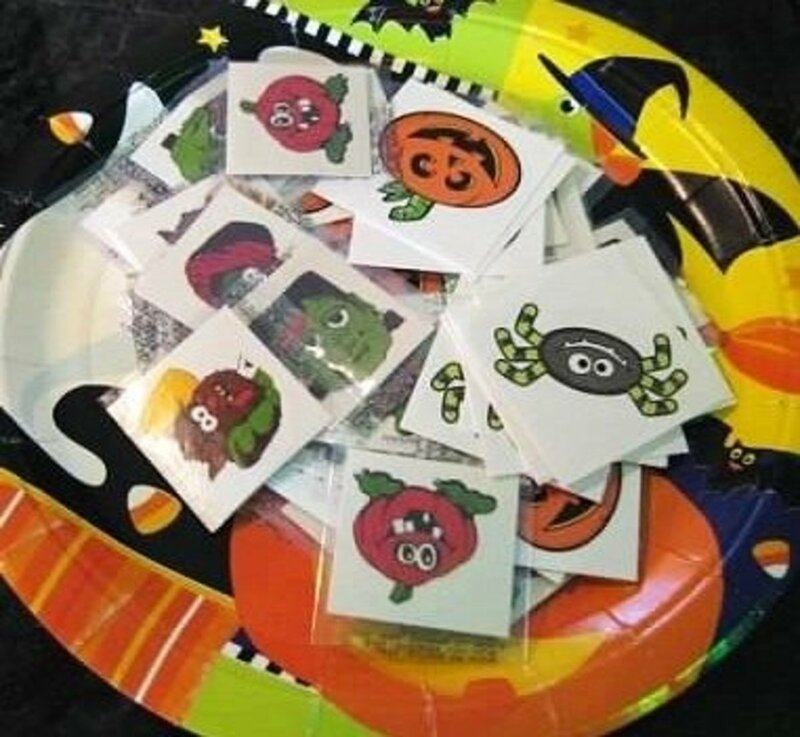 I purchased a bunch of Halloween tattoos and placed them on the kids during the party. 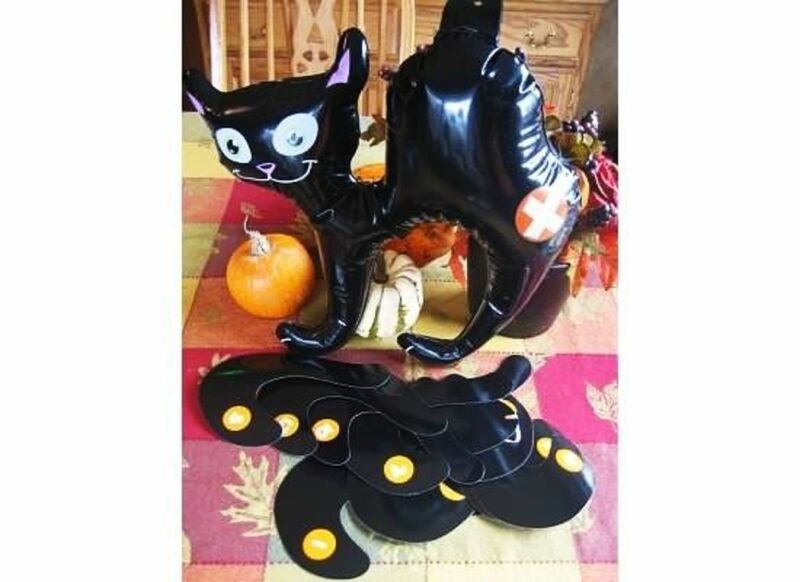 Pin the Tail on the Black Cat - This cute inflatable black cat also makes a great party decoration. This was a cute game for the younger kids. It featured an inflatable black cat. I taped the cat to the wall and the kids took turns trying to pin the tail on the cat. Which is your favorite Halloween party game featured here? 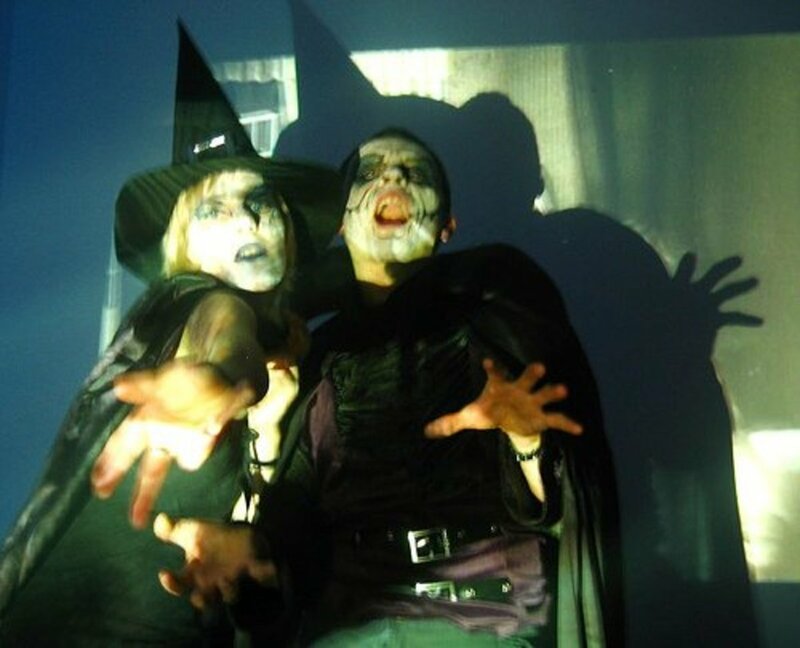 To set a spooky mood, we played eerie Halloween music on the stereo, used a fog machine and strobe light. We also replaced some of our high hat ceiling lights with green, orange and purple colored lights. Set the mood of your creepy party by playing Halloween music and sounds in the background. It is just not a Halloween party without creepy spider webs hanging around the room. A fog machine is a must have for your Halloween party. There are many fog machines on the market. 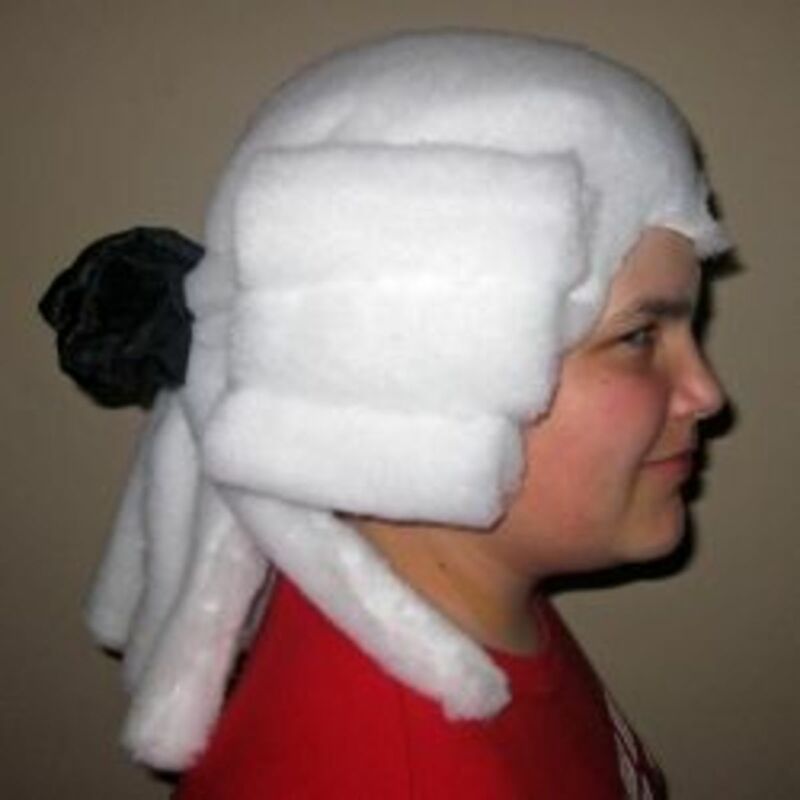 The machine featured here is similar to the one I purchased at my local party store. Oh I love all your ideas, Halloween sounds like a real blast at your house. 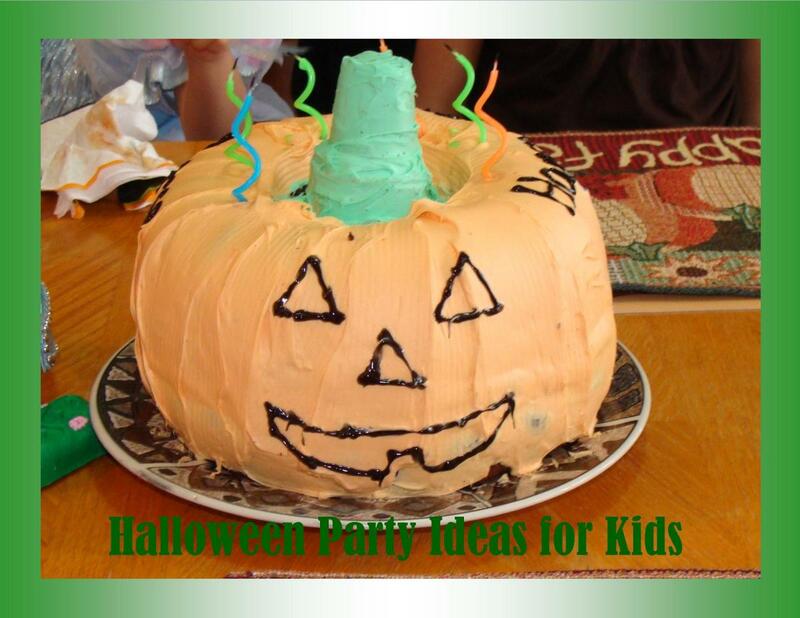 You've presented fantastic Halloween party ideas. Thank you! I really like the creepy soda bottles. Those could be fun any time of year. I would have a blast at a party like this! Happy Halloween early. Fun game ideas. Any child would enjoy a Halloween party like this. Wow! Now that's one Halloween party I would love to go to!! I love the decorations, all the activities, and I also love that fact that it is fun for children and adults. Great job!! Interesting colourful lens. The kids will certainly enjoy it!